Bah, can’t these folks figure out how to make swirly-cakey-goodies without partially hydrogenated oils?? Love the 100 calorie. Taste better than t he regular ones. I”m upset that our Wal-Mart iosn’t gping to carry them anymore. Is there somewhere else I can get them. 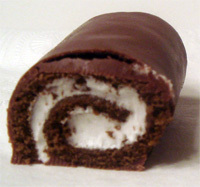 Little Debbie.. all the way! Not a healthy choice, but a tasty one for sure. I think Hostess HoHos are the only thing I have had like these and they do not stand a chance. Eat an apple 😉 its better for you! You’re right. 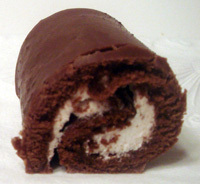 Freezing LD swiss rolls is an ultimate treat. I really like the chill and firmness (I miss my husband saying that about…) I need to get out more as well. Maybe we can do a meet up of us sugar addicts at the Hollywood Bowl. Maybe WB Looney Tunes night. We all fit. WOW. 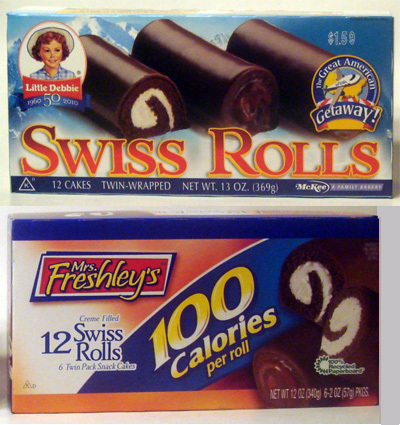 I actually found this post because I just ate my first Mrs. Freshley’s Swill Roll and was AMAZED at how much better they taste than Little Debbie’s! My husband brought them home from Family Dollar and I was expecting them to be subpar. They’re a little bit smaller; but they taste SO MUCH BETTER! I’m shocked. I honestly don’t know how anyone would prefer little debbie if they’ve had both. I guarantee you if you put them in a taste test, the Mrs. Freshley’s would win.